How to repair/replace old tongue and groove plank subfloor in bathroom? 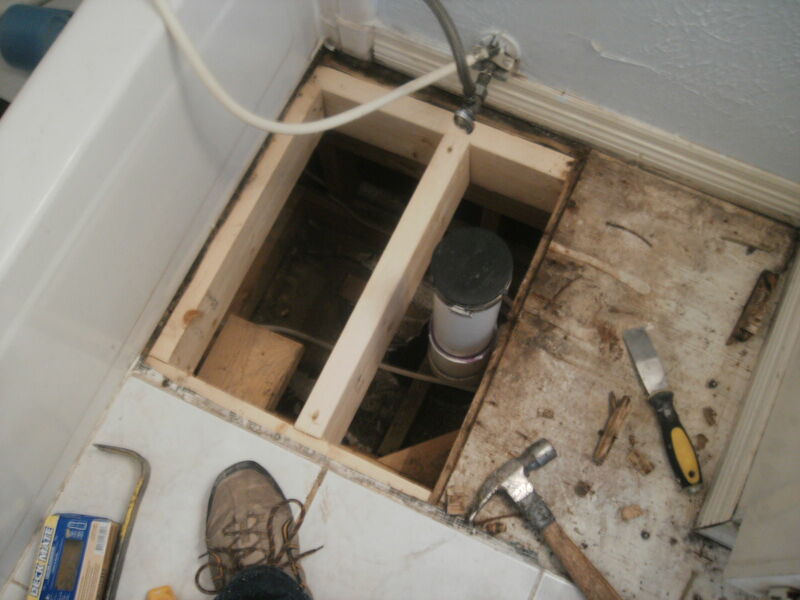 After my bathroom was demoed, I discovered that the subfloor is in bad shape. The home was built in the 1960s and the subfloor consists of 3/4" thick tongue and groove planks running diagonal to the joists. I do not know if it was poorly constructed or if this naturally happened over time, but the tongues and grooves of the planks across much of the floor are no longer nesting within each other. As such, the floor does not have much structural integrity. As you can see in the photo below, a section of the floor broke away easily during demo. There are other sections that flex so much that I feel like I'd break through if I attempted to put my full weight on it. This is a bathroom that will have a tile floor so the goal is to properly support the tile, a bathtub, etc.. Outside the bathroom is 3/4" hardwood and I'd prefer not having too much of a differential with this. I have had a few contractors present some different approaches that include cutting out the old floor and completely replacing it or simply adding a thin layer of new plywood on top of the old floor. The thin layer on top seems like the simplest approach but I have concerns with both building on top of a questionable old floor as well as about the extra height (what would be the minimum acceptable thickness for the new layer in this case?). What is the proper way to repair this floor? Lay 1/2 or (preferably) 5/8 over the existing floor. It's simple, and should provide enough strength with the existing strips to support tile. Replace the strips that are weakened (you should be able to find a piece of 3/4 that would fit the space. All strips should cross a minimum of three joists for strength. Follow up by laying 1/2" or 5/8" on top. Remove and replace. This is a challenging option, those strips probably cross the entire house, what this means is that the walls are resting on the strips. When you remove the existing strips it will cause sagging in adjacent rooms so you'll need to at least block out beneath the walls/between joists to support the flooring on the other side. You'll also have to block out in between joists, and at the edges where the joists are more than a couple of inches away from the bathroom wall. Once you've blocked out the floor reinforcements take a look at the joist spacing. Subfloor replacement selection - OSB or Plywood. For tile, plywood is generally recommended by manufacturers over OSB. Not all sheathing is created equal, however if you're picking up sheathing grade from a big box store, they hold a respectable graded sheet which is what I'm going to base the rest on. What's your joist spacing? What is the nominal size of the joist? If it's 18" and 2x8 (most likely case) or greater, you can probably get away with one 3/4, but I'd recommend 2-5/8" cross installed. If it's 16" and under, you'll be fine with a single 3/4"
If you're going to lay sheathing on the existing floor, you need a minimum (emphasis on minimum) of 3/8". Whether it's T&G or not, anything less than 3/8 is a waste of money as it's not structural. Either T&G, or square edge is fine, what's important is to space them 1/8" apart (use something that's credit card thickness for spacing). Ideally glued in the seam if it's T&G, and to the joist using an ASTM D3498, or APA AFG-01 conforming adhesive (PL-400/Premium, Lumber Lock, AdvanTech for example). Before applying the glue, make sure all surfaces are clean and dry. Otherwise 16d common nails will work. I wouldn't chance going over it either. If it's easily breaking and giving when you walk on it, replace it with new T&G sub flooring. Otherwise, you are going to have a bunch of cracked tiles. You might even have some floor joist issues to deal with and you can't really find that out without removing the old sub flooring. You can start by cutting as close to the wall as you can with a skill saw. Set the saw depth just low enough to get through the existing sub floor. The circular saw will not get right against the wall because of the guard. You will need to use a reciprocating saw, jigsaw, Bosch Starlock Plus or Starlock Max. Once all of the old flooring is removed. Make sure all nails & screws are removed and the tops of the joists are clean and level. Install the new sub flooring with liquid nails on each joist. If you run into joist issues you'll need to ask another question. Cost is the biggest issue. Replacing it completely is the obvious choice. That's expensive. You can easily add 1/4" ply glued and screwed down and it will be totally structurally safe. You may however get squeaky, spongey floors. If you can fit it in your budget redo it with a new flooring material especially if you are going with tile. It's often less expensive to do it right once. Not the answer you're looking for? Browse other questions tagged bathroom subfloor or ask your own question. 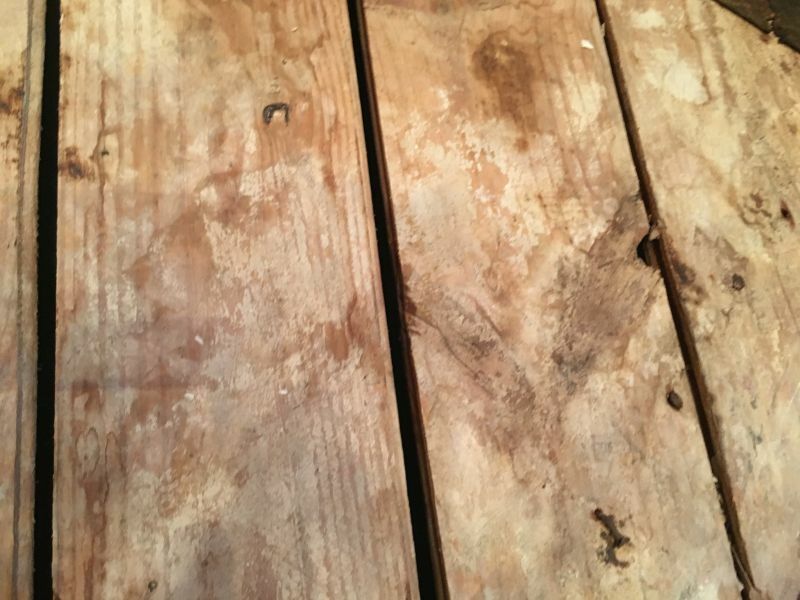 How can I remove just one tongue-and-groove subfloor board? Why cement under upstairs bathroom floor? Should I replace bathroom OSB subfloor with plywood? Hardie Board Subfloor—Thinset or No? How high can a 'sub floor' be raised withh plywood sheets? How to flatten an uneven plank subfloor when the existing planks can't be removed? Can I use self leveling compound to level old thin set over plywood subfloor? Tiling over old 2x6 tongue and groove subfloor. Underlayment? Levelling? Insulating tiled floor in the basement? 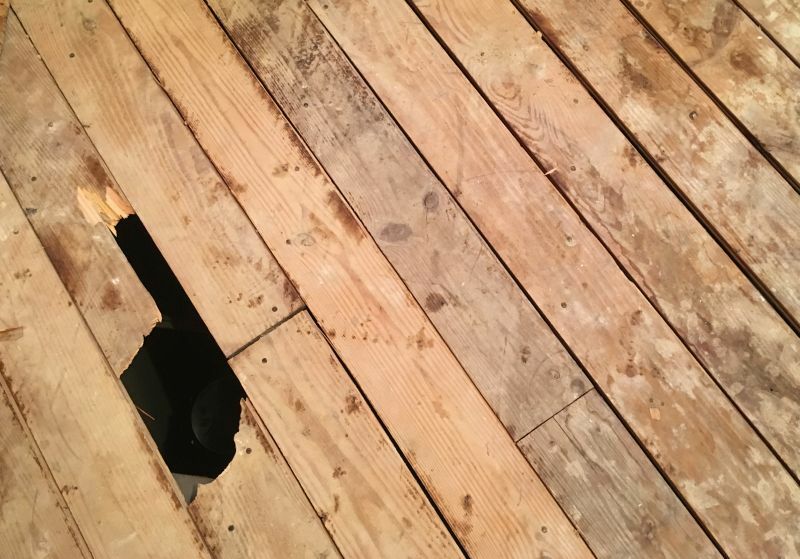 How do I repair my partially rotted subfloor?